Western Frontier is a game which is themed around the Wild West, but the design is far from being an inspiration for fans of the genre. Microgaming offers here an older looking game, which has some cool features to make it more attractive, but I’m not sure that it’s going to be enough to make it a popular choice. There is also a lot of competition out there, with many developers offering at least one Western themed game. The game looks old enough, but the features and the design suggest a more recent title. 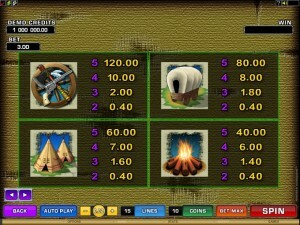 It has 5 reels, 15 lines and as features wilds and scatters, plus Indian and Cowboy features with free spins and multipliers. Top payouts of Western Frontier reach $3,750. While the base game gives you the scatter symbol and a wild, the free spins that they trigger will have all sorts of other goodies for you, mostly revolving around wild symbols and their multipliers. You’re going to get the Wild Horse wild symbol on all the reels of the game. This symbol serves as a wild, so it can substitute for other symbols. It’s much more useful during the free spins, as it can add a multiplier as well to the win. The base game wild doesn’t have that multiplier. The Horseshoe scatter symbol will make appearances on all the reels, and it will give away some prizes when two to five icons appear in random locations. The scatter ability means that it doesn’t matter where exactly these symbols have landed. 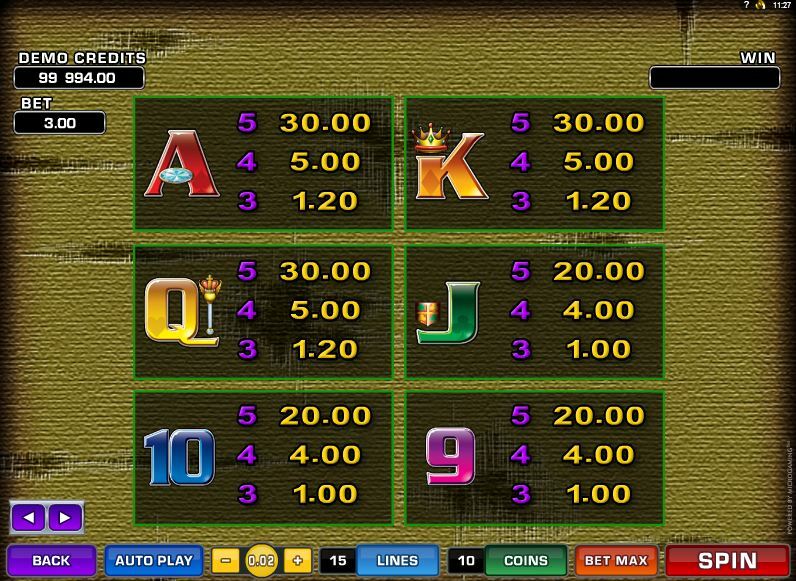 Payouts vary between 2x and 100x the wager. The game’s free spins need 3+ scattered Horseshoes to get started. You get 8 free spins at first, and you can retrigger additional ones if you have the required scatters. The wins which are formed with the help of the wild Horses will have 2x multipliers applied to them. The Horse wilds which appear on the reels will be added up and depending on how many you get, you will then gain access to another feature, called Cowboy. 0 to 3 wilds will bring you the Cowboy feature with 8 free spins and wild multipliers of 2x. 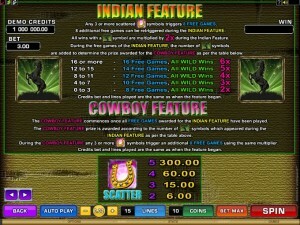 4 to 7 wilds during the Indian feature will trigger 10 free spins and 3x multipliers for the wilds. 8 to 11 gathered wilds will offer 12 free spins and 4x multipliers for wild assisted wins. For 12 to 15 wild Horses, the game offers 14 free spins and 5x multipliers when the wilds get involved. 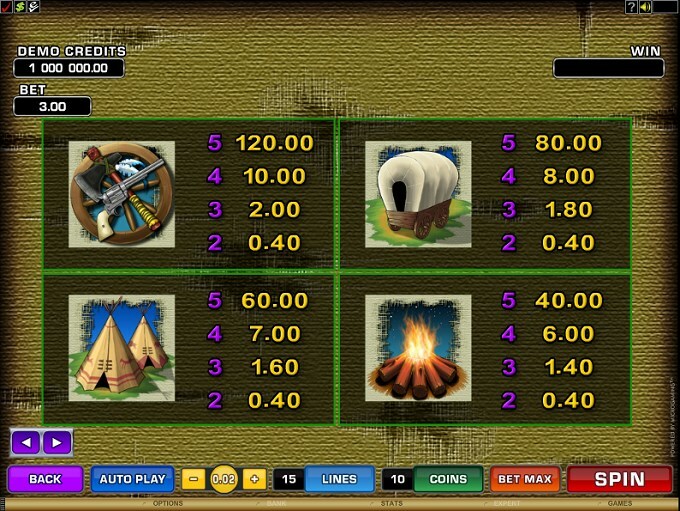 Finally, for 16 or more wilds obtained during the Indian feature, you get 6x wild multipliers and 16 free spins. 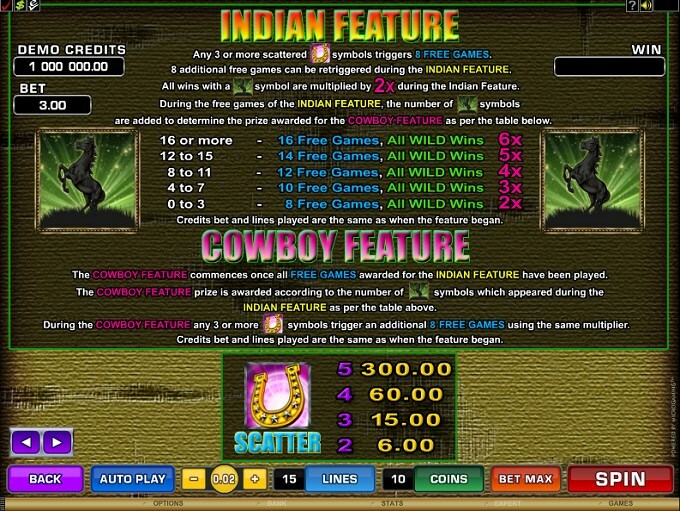 The Cowboy feature starts once the Indian feature ends with all its free spins. 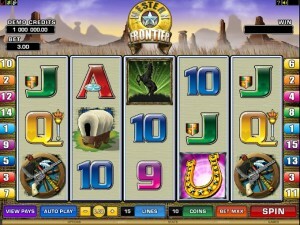 You can retrigger the Cowboy feature with 3+ Horseshoe symbols, which will give you another 8 free spins. The coins might only go from $0.01 to $0.50, but up to 10 of them can be used on each bet line, meaning a maximum line bet of $5. With 15 lines available, a maximum wager of $75 is possible each spin. 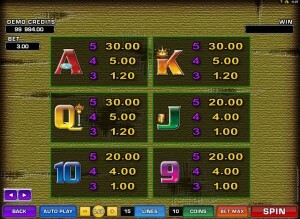 You can win 7,500 times the line bet with the right five symbols on the same line, meaning 75,000 coins or $37,500 in this case. The Western Frontier design looks old and not very appealing. Partly to blame are the playing cards, old style things that are used in the exact same form in other slot machines with various other themes. The themed symbols aren’t exactly modern looking either, looking like they have a low resolution. Overall, it’s not a game that you play for its design. Symbols: Horseshoe (scatter, 100x the bet), Horse (wild), Weapons (600x), Wagon (400x), Tee Pees (300x), Fire (200x), Ace (150x), King (150x), Queen (150x), Jack (100x), 10 (100x) and 9 (100x). The features would be the ones that have the potential to convince you to play it more than a few spins, while the design will work against it during all that time. 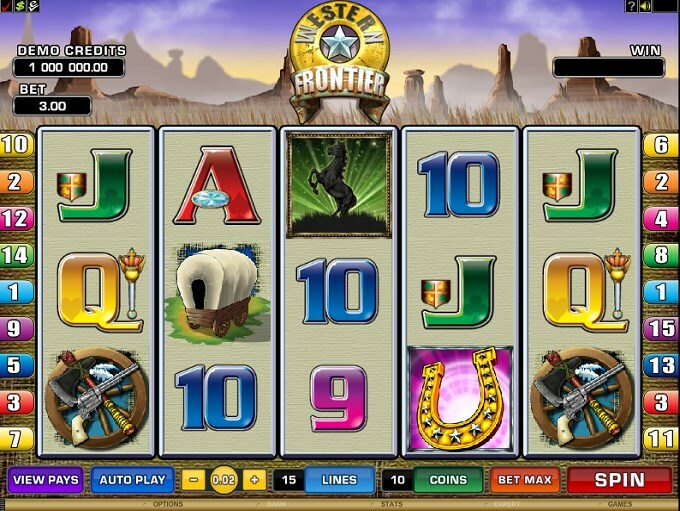 The Western Frontier slot machine is offered through the Microgaming platform, so if you want to play it for real or just to practice, look out for casinos that use it.